Will the people thwart Government drive for baby killing on demand? 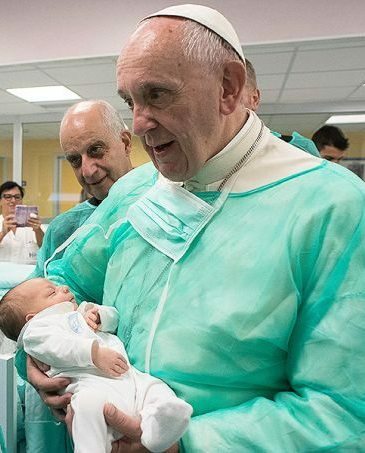 The Pope is to visit Ireland in August but will the occasion be blighted by a referendum result where the country has just voted for the legalisation of baby killing on demand? It’s apparent that both Government and pro abortion lobbies are going out on a limb to get the referendum out of the way ahead of the papal visit. Far from the process being rushed, as claimed, to enable the student population to vote, the real concern many feel is that a date for the referendum closer to the papal visit would defeat what abortion proponents hope will be overwhelming public support for the repeal of the child protecting Eighth Amendment. The last few weeks in particular has witnessed a tidal wave of attacks on the Eigth Amendment, and, too, in places strong condemnation of the electorate, mostly women, who, back in 1993, voted en masse to give the present full constitutional protection to both the mother and child. Of the more than 1,265,000 who turned out for the Referendum in September of that year, nearly 70% decided in favour of the inclusion of what is now the Eighth Amendment in the constitution – double the number of those who voted against. Today, it is widely acknowledged that the wisdom of the people in 1983 has saved the live of countless thousands of Irish children whose lives might otherwise have been extinguished in abortion chambers of death. Ireland meanwhile has also gone on to become one of the safest places on the planet to have a baby. Subsequent provisions have allowed women, if they felt so inclined, to travel for abortions abroad. However, official figures show that the number travelling from the State to the UK has been falling steadily, even during a period of time much longer than abortion pills have been easily and illegally available online. What isn’t entirely clear is the reason why thousands of women still travel to Britain to have their baby put down. According to figures for 2015, 10 of the total of 3,265 were less than 16 years old. Some 48 per cent of those who gave Irish addresses were aged in their 20s and 37 per cent were in their 30s. To believe that all of the thousands of abortions were justified on health grounds would surely be carrying things to the extreme. For the record, official figures indicate that 141 of the abortions carried out in 2015 were performed under what is described as ground E, a category that includes Down Syndrome, cleft lip and palate and other medical conditions. Were groups that are now seeking to overthrow the Eighth Amendment to be successful, it appears highly probable that Ireland would very soon become a killing ground for multiple thousands of unwanted babies. Given the slaughter of the Northern Ireland “troubles” when more than 3,500 people were killed, 52% of them civilians, what possible reason can there now be for more killings, this time the killing of the most innocent, on this island? Pope Francis is scheduled to visit Ireland for the ‘World Meeting of Families’ in August. Would it not be shocking and truly tragic were the country’s message during his visit to be that it had just legitimised a regime for the intentional torture and annihilation of innocent infants in the womb?